A seatbelt can save a life. They are incredibly important safety features that often are not used on public transport. Those who do not wear seatbelts put themselves in greater danger to severe injury or even death. Small reminders such as these economic and easy to use seatbelts worn at all times labels could potentially save a life in the event of a crash. Having a symbol directly in front of a viewer as a constant reminder can influence the behaviour of people, leading to more seatbelts being worn. Self Adhesive Vinyl: A high gloss, flexible PVC vinyl with self-adhesive backing. Suitable for applying to most smooth, dry and clean surfaces. Ideally suited for internal signs. A seatbelt can save a life. They are incredibly important safety features that often are not used on public transport. Those who do not wear seatbelts put themselves in greater danger to severe injury.. 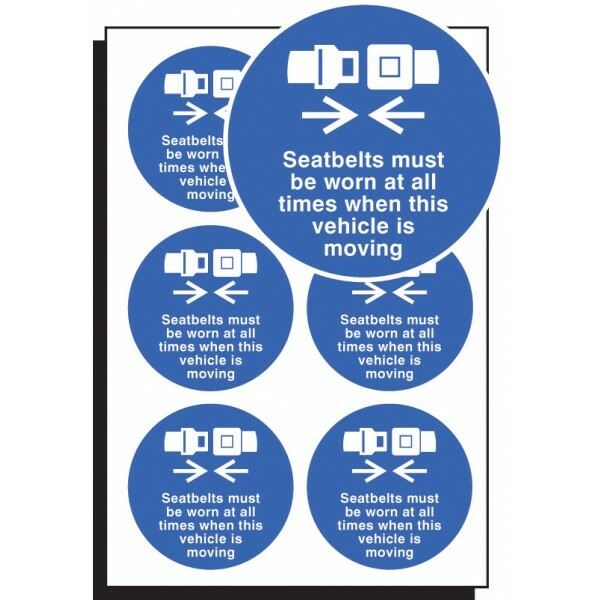 Enables coach and bus operators to inform passengers of the requirements of Motor Vehicles (Wearing of Seat Belts) (Amendment) Regulations Material Options Explained Below is a more detailed descript..
School information sign. Material Options Explained Below is a more detailed description of the materials this particular safety sign is available in. Helping you decide which sign option is most sui.. Advise staff, visitors or schoolchildren of policies relating to electronic devices and restriction of use in dedicated areas or buildings. Material Options Explained Below is a more detailed descrip..